Pallets provide a safe, effective shipping and storing platform throughout the demanding and diverse situations in your product's journey to your customers. 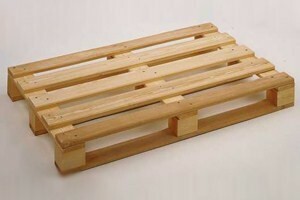 Pallets should be designed to accommodate and protect your unique products, their configuration and packaging. To reduce costs and ensure the protection of your product, we would like to know about your product and how it will be handled. Pallets can be designed to accommodate any unique automated equipment performance requirements, shipping methods and containers. Four-way pallets allow entry on all four sides. Two-way pallets allow entry on only two sides. Reversible pallets have the same number of decks boards on the top and the bottom. Skids come without bottom deck boards. Please indicate what the product you are shipping is, expected weight per pallet, dimensions and any unique requirements that may impact the pallet configuration. -New Lumberis bought directly from the mill and is in premium condition. -Recycled Lumber is good quality material recovered from other industries. -Reclaim Lumberis structurally sound material reclaimed from dismantled pallets. If a Recurring Order, How Often? Number of top and bottom boards, number of stringers, etc.